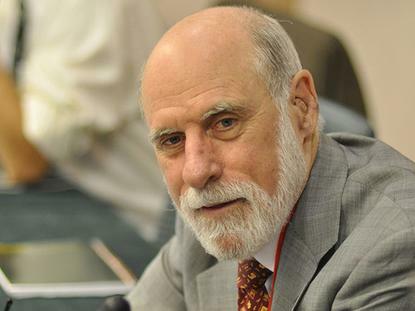 Vint Cerf, known as one of the fathers of the Internet, has said that the Web and our digital devices have become integral parts of our lives, changing the way we discover things, who we communicate with and even how we think about communications. The American computer scientist, who has worked at IBM, DARPA and now Google as its vice president and chief Internet evangelist, said that the best of the Web is still ahead of us. "The future of the web is limited only by our imagination,” Cerf wrote in an email to Computerworld. “Ninety-nine percent of what we will do on the Web has yet to be invented." The Internet has numerous security challenges, and it needs more users and ISPs to adopt strong measures like encryption, two-factor authentication and HTTP over SSL, said Cerf, chief Internet evangelist at Google, in a speech at the National Press Club in Washington, D.C. Recent calls by the FBI and other government officials for technology vendors to build encryption workarounds into their products is a bad idea, said Cerf, co-creator of TCP/IP. "If you have a back door, somebody will find it, and that somebody may be a bad guy," he said. "Creating this kind of technology is super, super risky." FBI and other government officials raised concerns after Google and Apple announced last year that they would offer new encryption tools on their smartphone OSes. Without the ability to collect data stored on smartphones and other electronic devices, police will be hindered in some investigations, law enforcement officials have argued. "I ... believe very much that we need to follow the letter of the law to examine the contents of someone's closet or someone's smartphone," FBI Director James Comey said last October. "But the notion that the marketplace could create something that would prevent that closet from ever being opened, even with a properly obtained court order, makes no sense to me." Cerf said he understands the tension between customer demands for privacy and law enforcement needs to investigate crimes. "We have to do something if we wish to protect the citizens of our country and others from harm in this network," he said. "I accept that governments are there in part to protect their citizens from harm." A debate on the right levels of security and privacy will continue in the U.S., he said. "Our job, in the U.S., is to figure out what is the right balance for us," he said. "The Congress is forced now to struggle with that." Cerf was asked if lawmakers adequately seek out the advice of technologists during Internet debates in Congress. They don't, he replied, but he considers it a "privilege and responsibility" to help educate policy makers about technology issues. "I'm not looking for technical depth [from lawmakers] here," he said. "I'm looking for simple, cartoon models of how the network works that are accurate enough so ... you will reach the right kind of conclusions about what policies are implementable." The job of technologists in Washington is to "try to be helpful, to provide clear enough explanations about how this stuff works," he added. "The worse thing in the world is to pass laws that can't be enforced or can't be implemented, because it encourages disrespect for the law." Cerf also defended the U.S. Federal Communications Commission's recent and controversial decision to pass net neutrality rules by reclassifying broadband as a regulated, common-carrier service instead of a lightly regulated information service. Google has supported net neutrality rules, although the company wasn't very vocal during the recent FCC rulemaking process. Many broadband providers have argued that reclassification is unnecessary and could hinder investment in new broadband networks. But Cerf argued that ISPs shouldn't be able to influence customers' Internet use. No ISP "should have anything at all to say about where the traffic comes from and where it is going," Cerf said. "Everyone should have equal access to the 'Net. Preserving user choice is fundamental to the Internet's utility."